In this episode, after defeating the seven Dark Generals, the Fusion Fighters make it all the way to the final land, where they have to face off against... the seven Dark Generals! We really shouldn't be putting up with this sort of thing. The Fusion Fighters have battled their way through seven lands, seven generals, Underworld, and that one episode introducing Ewan where the art was all funky. Most of these took two or three episodes each, so five episodes to deal with Ewan, AxeKnightmon and Bagramon seems about right. 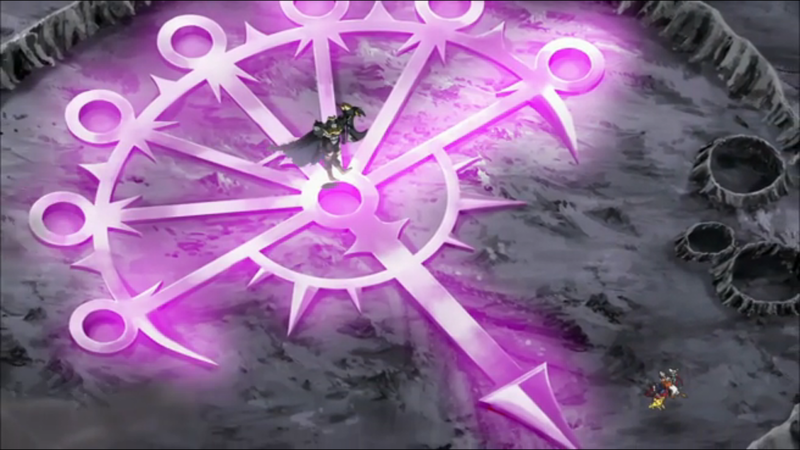 So it's fair to react with skepticism when the first thing that happens after the seven Dark Generals are dead is AxeKnightmon reviving the seven Dark Generals. Welcome to Dr. Wily's capsule room. The general concept, and even the heavy use of recycled animations (pretty sure we get the same reaction shot out of Christopher and Nene three times) suggests a lack of effort on this episode. We could have delved into Ewan's descent, or had a proper battle with AxeKnightmon, or something worthy of a five-episode arc. We want to start wrapping things up, and throwing all the Dark Generals back in feels tiresome. The only thing making this stunt tolerable is that we will get everything we want in the final three episodes. Just not right now. That said, what actually goes down has a lot of neat elements to it. For one, it's fair to give the seven generals a proper curtain call. The unusual format of this second half has given each of them their turn as the star, featured far more in their time than Bagramon himself. Having them all back and fighting again is a tough sell, but there's nothing wrong with seeing them again. It's also a good demonstration of the serious power the enemies are wielding. We got a brief glimpse of the good that the unified code crown can do. 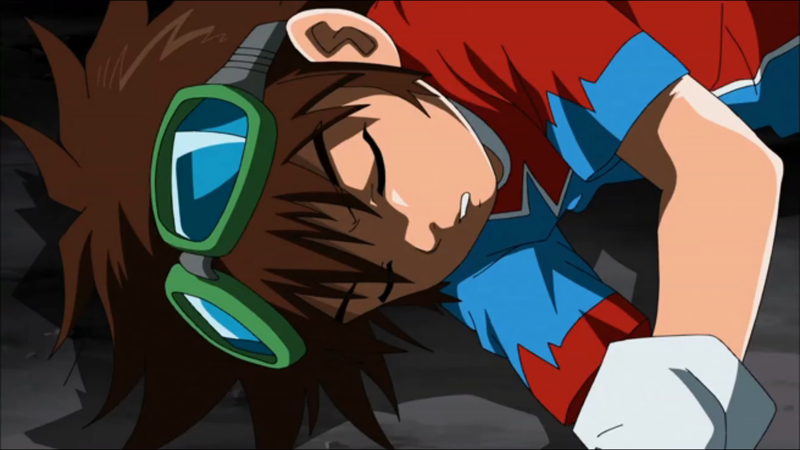 The part about all the fallen Digimon coming back to life has been a particular sticking point. 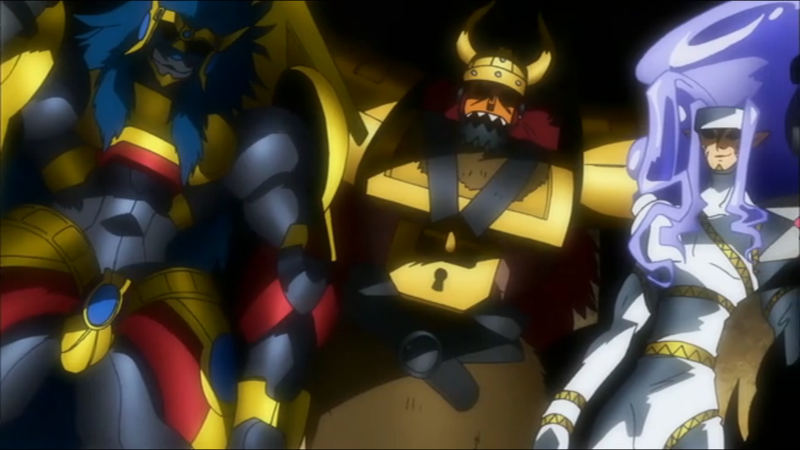 It was one of Shoutmon's priorities as king, and after Deckerdramon's death even Christopher has been on board with it. Bagramon, of course, sees otherwise. But that power is still there in the code crown, so why not manipulate it to only bring back your allies? It's a good move, especially combined with the dark fusion to create Grand Generamon. This ability to extract digicores is another frightening new ability. Yes, we have to pretend that the concept of the digicore has been established, but it's not too hard to accept. All the talk about Digimon being real sentient creatures has to have some foundation, right? Hence the digicore, and the lifeless shell a Digimon becomes when it's gone. AxeKnightmon using this ability on the revived generals is intelligent planning. Using it on his enemies is powerful and intimidating. There's nothing quite like having to figure out how to carry your fallen comrades back to safety. Mikey volunteering to have his digicore extracted is all over the place. Considering that there's considerable doubt over whether or not Mikey even has a digicore, it's a big leap of faith. According to Wisemon's technobabble, the human soul is an equivalent, but thinking that AxeKnightmon's dark stone can pluck those out too? Scary stuff. It really is the only option, however, so Mikey's sacrifice isn't quite as idiotic as hyped. Noble, frightening and even sad might be better emotions to convey. Even Mikey's big speech about Christopher holding the fort while he's gone is less a show of trust and more common sense. Really, the stretch is that AxeKnightmon agrees to it. It might be one of his bigger strategic blunders to let Mikey talk him into the extraction. Locking Shoutmon and his fusions won the game well enough for his purposes. AxeKnightmon seems like he's responding to Mikey's triple dog dare to take him too. All it does is reunite Mikey with Shoutmon and company, all really unified and all really pumped to fight this soul-sucking thing. Probably not the best position for AxeKnightmon to have put them in. Everybody on the team is positive that the unguarded entrance to the castle is an obvious trap, but that they have no choice but to spring it. Isn't that what the Monitamon are for? Or at least a smaller part of the team. Throw the PawnChessmon out there; they haven't done much lately. Something seems off with Ballistamon this episode. Until the big dramatic speeches at the end, most of his lines are very robotic. I mean, he is a robot, but he isn't usually written that way. Even if they did have their cores, Mikey's really going out on a limb in thinking that Olegmon would automatically take their side. They had a great deal of respect for each other once he was defeated, but expecting that he'll just jump ship at first suggestion? It'll take... well, it'll take another episode worth of desperation for that. Awfully odd and pretty cool that Greymon has the most compelling argument to let Mikey's core be extracted. It's also a reminder that this angle has been used in a previous episode. There's some pretty cool ambiance created in Prison Land with Mikey talking through his disorientation and confusion in this place, and it actually takes a bit of time for him to get his bearings back. Not long enough to disrupt the whole episode... just a bit. Oh wow. You really weren't joking with all those Megaman comparisons.